Residenza Maxima Rome, Apartments near the trendy Trastevere quarter of Rome with private garden and full living facilities. The Maxima Residence is made up of 11 beautiful self catering apartments. By staying at our elegant apartments you can discover everything Rome has to offer, and even more appealing will be your discovery of our fantastic rates and availabilities when you book online with the Residenza Maxima. Surrounded by a delightful private garden and located close to the stunning Doria Pamphili Park as well as the trendy and characteristic quarter of Trastevere, the Residence is the epitome of relaxation. 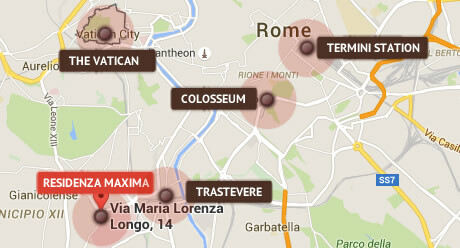 Occupying a stunning Roman city centre Villa, the Residenza Maxima just opened in 2007. From our nine self catering apartments you can take joy in the privacy of your own space while taking advantage fantastic facilities and multi-lingual staff who will endeavour to help make your trip the best it can be. Uncovering the mystery Rome hides by peeling away layer by layer, as if undoing the work of the Romans as they slowly filled in throughout the centuries each gap and crevice layer by layer, will amaze and astonish even the most experienced of travellers. For underneath the city we walk today is a whole other Empire sitting in wait for its discovery. Rome, from the time of Caesar through that of Michelangelo and to the present day, has continued to be a source of discovery, inspiration, and above all, beauty. Where layers of history spill over one another to tell a story rich in legends, triumphs, falls, creations and discoveries. From the ruins of the ancient city, to the wonder of the Sistine chapel, let this magical capital reveal itself to you while staying at the Residenza Maxima..